Divi is a beautiful multi-purpose template released in 2014 by Elegant Themes. Designed as a powerful and flexible tool, Divi is capable of sustaining various website types. In September 2016, the author improved the theme’s functionality with a new and amazing front end page builder. This template is built to bring versatility, dynamism, and performance to your site, saving you from the hassle of adding custom code. Divi’s control options are designed to help you personalize your website’s width and typography just by clicking on the settings buttons. The Elegant Themes product is responsive & retina ready, and it also gives you the option to see how your site will behave on a distinct device. 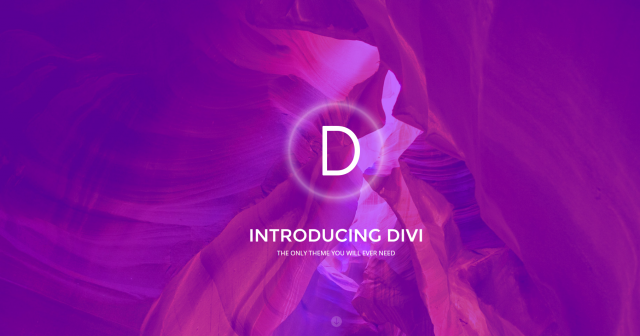 When you install Divi, you will discover there are no demos included. You don’t have to worry – the custom page builder comes with 32 pre-made layouts that will give your site a quick start. This theme allows you to create amazing pages with ease. Each page of your website can have a distinct look, enchanting your visitors with diversity. When you want to add a new element to a page, you just have to hover over the section, and a setting box will appear. The content tooltip is following you through the control panels providing you with related information. If you have a brilliant idea and want to type it down, with the Visual Divi is possible to start writing it at that very moment. And if you get inspired, it’s good to know that the theme comes with over 40 blocks, called content modules. You can design pages and save them to the Library for future use. No page refresh needed since every adjustment happens in real time. Once you have settled the design of the pages, the next important aspect you need to solve is the menu. Usually, the menu is displayed horizontally, but with Divi, you can choose to have clean pages allowing your visitors to pay attention to the content by setting a vertical menu. 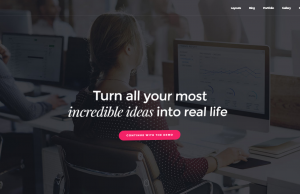 This is not a new concept, but with Divi, the author managed to create a delightful navigation focused on user experience. This way, visitors can focus on your topics without getting distracted. It’s easy to create one-page websites with the side menu option enabled. Users can be guided to the desired section using the smooth scrolling function for custom links and the dot navigation. When using Divi, you can choose to display the website’s header in five different ways, and also customize the typography elements and colors. For each font, you get control buttons, and you can see in real time how words are expanding and compressing to help you decide the perfect shape. The theme has three custom widgets, ET About Me, Adsense, and Advertisement, that you can use on sidebar areas. With the Divi Builder, you can enable dual sidebars, by adding the ‘sidebar’ element in two column sections. Divi has a section in Theme’s Options panel that is dedicated to SEO and AdSense, so it is easy to optimize your website for search engines and monetize it. Divi has the settings structured in Theme Options and Customizer. The Theme Options panel appears on the backend and offers you a quick way to adjust the website’s general, navigation, layout, ads or SEO settings. The Theme Customizer is located on the front end and gives you access to typography and color options for buttons, posts, pages, blog section, header & footer settings. 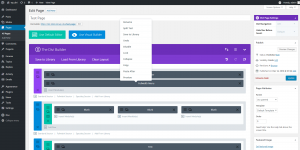 There is also a third panel called ‘Module Customizer’ that was specially created for the frontend and you can modify all the page builder elements. You can even switch between the page builders and make changes in different tabs. Your modifications will be synchronized and automatically saved. With the new Visual Builder, it’s easy to remember what options (size, position) you preferred after you saved a page. The frontend builder allows you to add values or units by dragging padding indicators. One of the front end’s most important functionality is the ‘undo & redo system’ that gives you the possibility to go back and forth to re-check your latest activity. Customizing elements with the two drag and drop builders will bring a note of artistry to your posts and pages. You can integrate video sliders, counters, pricing tables from a list of over 30 graphic elements called the ‘modules.’ Elegant Themes author also brings you the ‘Elegant Icon’ – a package of over 350 icons ready to be used as a ‘blurb module’ and style individually. Divi comes with a useful website optimization tool, a split testing system, called ‘Divi Leads.’ This test helps you to plan and perform tests on any website item, from content to design. With Divi Leads, you can check your site’s elements and choose the best version to acquire a better conversion rate, based on user clicks, readings or sells. If you have selected your subject, the ‘Divi Leads’ will duplicate it and display both versions to test which one makes better conversions. 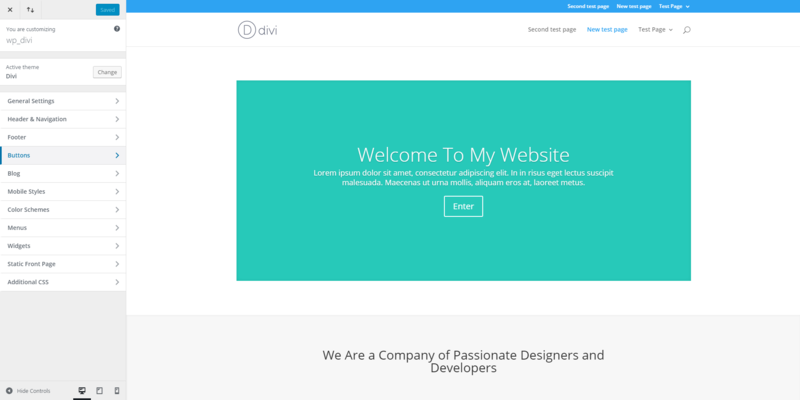 Divi theme is compatible with the most popular plugins, including WPML multi language. For those who want to create an online store, Divi may be a choice since it’s compatible with WooCommerce. Since one measure can’t fit all needs, the Elegant Themes author has created three different price packages. In the first one called ‘Personal,’ you get access to over 85 themes, updates, support and unlimited website usage. The ‘Developer’ pack offers you all the above plus complete access to all their custom plugins like Divi Builder, Bloom, Monarch, HandHeld, Shortcodes, Anticipate, ET Builder (legacy), and layered Photoshop files. These two kits are using a yearly payment term, but there is the third offer with a higher price as a one-time fee for ‘Lifetime Access.’ This system allows you to choose whatever you want to download: which theme, which plugin, without crowding your website. We have tested Divi’s default demo on different page speed tests, and the content loads at a medium page speed. 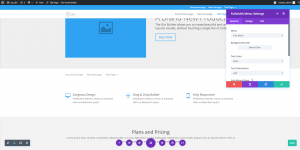 Demo designs are not available in Divi theme. On the author’s website, you can find pre-made layouts packs that need to be downloaded and then imported to your Divi Library. You can load a layout from the library using the page builder. This process might be time-consuming. Custom typography is available only if you paste the font codes into CSS boxes. Divi comes with plenty of .po and .mo language files but doesn’t include a built-in translation panel. 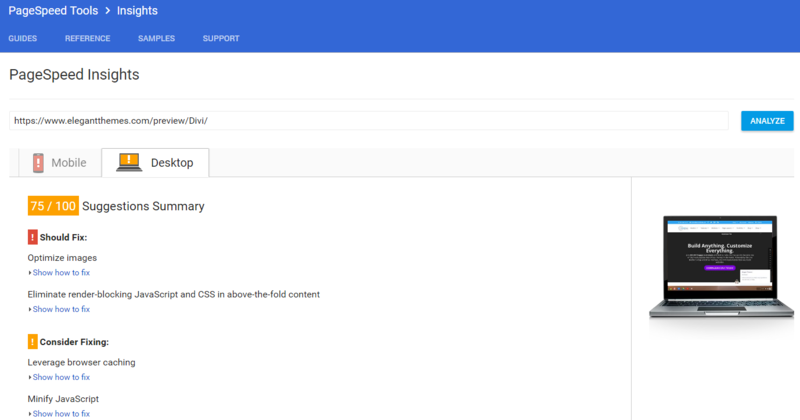 The Divi’s documentation is rich and well structured, but it may be difficult to find something specific since there is no search button to get you directly to it. Building a website with Divi is a great experience for every WordPress user due to its drag and drop functionality and live customization. Since the launch of Divi 3.0 on September 7th, 2016, the theme was kept continuously in the loop by its developers. With 23 updates since the major improvement, Divi got through a lot of fixes becoming more automated and user-friendly. This template is suitable for any website you want to create, from business, medicine, arts and everything in between. Divi is fully customizable, and you can come up with new, special and stylish pages that will be one-of-a-kind, with highly optimized elements. Great article for WordPress lovers and beginners! I recently bought this theme, but never used it, ‘cause it seemed very overwhelming. I was even thinking to ask a refund. I have a hard time using the panel.. Any help? Hi, John! Thanks for your feedback. If you are having trouble using the theme’s features, please keep in mind that you can always ask the author and get help from the support team:). It’s even better now. Try it again if you have not done so. 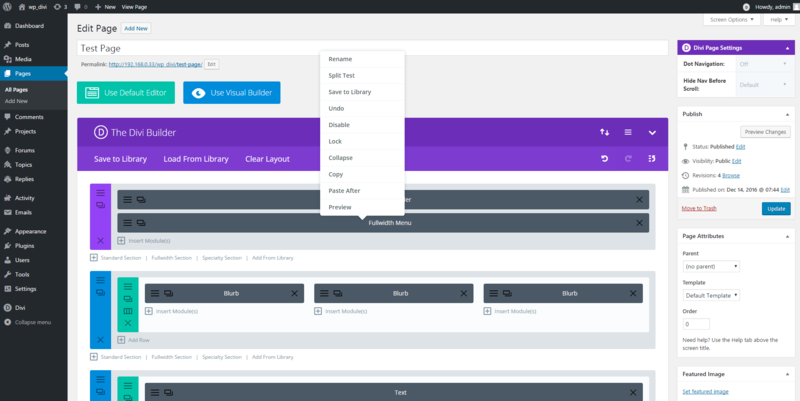 They have revamped their documentation and tutorials and now both the visual builder and back end building blocks builder can be access right in the front end visual builder as Visual & Wire-frame views respectively. Wish the author of this review can update it with all the new features and re-visioning ElegantThemes has done to the Divi Builder. Hi, Jason! Thank you! We appreciate your feedback. Hi, don’t ask for refund!! Just give it try, I use the Divi on my site and I’m IN LOVEEE! Sure, it has a lot to take in, but it’s not boring. You can take a look on the theme docs and videos to read more about the Divi’s functionality. Maybe this helps you to reconsider using it! Hi, Dave! Thank you for taking the time to share your personal experience with this template, and help our visitors! 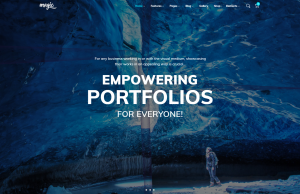 I used the Divi 3 theme by Elegant Themes on 2 websites, and what a HUGE mistake that was. Their interface is very difficult to navigate and hard to teach someone not very web-savvy how to use it. But the worse part is that the software is so incredibly buggy, you will be forced to pay their annual subscription fee to get their updates which fixes some of those bugs and introduces new ones, even after you’ve already paid for the theme itself. It’s a form of extortion, if you ask me. Once you have a site set up what that theme, it’s incredibly difficult to switch to another theme due to the proprietary nature of their awful interface. So if you’re considering Divi or any theme from Elegant Themes, DO NOT DO IT. Thank you for sharing with our readers and us, the experience you had with this product.